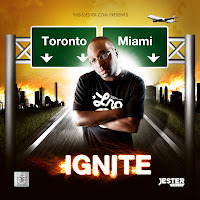 Welcome to Calgary Soca - Jester, JUK in Calgary this April. As a longtime resident of Calgary, a promoter, and a lover of Soca music, I've started this blog so Calgary's Soca Community can keep itself in the loop with all things "Soca" in the city. There should be lots to do and see here as the community grows. Feel free to comment on any of my posts and get involved by 'liking' and posting on the facebook page. The blog will be dedicated to regular reviews of events, mixes, artists and shows. Also I'm happy to introduce you to out our brand new chatroom, found on the bottom of the page and video links to the hottest Soca tracks. Warning! I'm going to be brutally honest with my posts, and therefore so should you! But of course lets keep it all civil and moving in a positive direction. No, We aren't involved in this event, but Yes, you should check it out as Jester ranks as one of my Top 5 Soca DJs in Canada. Event Rating: 'Tundaclap' has been a strong promoter in Calgary's Dancehall Reggae scene for years. He's branching to Soca now and has made a good choice in bringing Kid Kut, Jester, and Jump-Up-Kings to play. I won't be able to make the event myself as I'm playing a Hip Hop/House event Saturday nite, but that shouldn't be your excuse. I can only therefore rate the event on how good I think it WILL be. Haven't partied here so you will have to tell me. Make sure you click on comment below and give us your rating out of 5stars to let us know what you thought the event went ('cause you're going right?!) Then click on the share links, and let all the other Soca-Lovers you know about CalgarySoca.com. Im Totally Pumped about this event. His turnout is Decent and I know he's been working very hard to please for this event!! !